I promised a giveaway for christmas and thought I'd better arrange it now so it can be shipped before the last posting dates. On offer is one of my new laser cut decorated christmas tree kits. Please make sure you let me know that you have done so with your comment, so I can add your name into the draw more than once. Names will be put in a hat and a name drawn at random. Please make sure I can contact you to arrange shipment. I will ship Internationally via airmail. Ya tienes una seguidora más,me gustaría participar en tu sorteo! pongo tu enlace en mi blog! Ya he participado en Facebook, como Mª Luisa Vera.Muchas gracías!! Looks so lovely - liked you on FB and shared it there too.. Thank you all. Just 2 days to go! Bellissimo e originale.....partecipò con grande piacere!! I've been coming across your mini work online for weeks, but Jazzi's feature is how I finally found your blog. Please count me in on your giveaway. I just added it to my blog, and "Liked" you on Facebook too. Great tree, please include me. I added a link to my sidebar. Just a few hours to go until the draw. I will pull the winning name out of the hat this evening. Hello Jennifer! 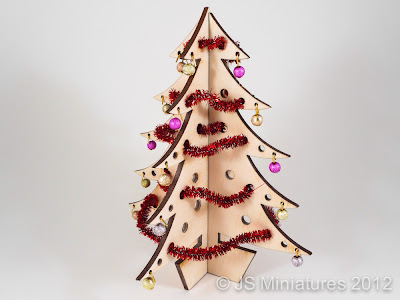 What a lovely tree kit to offer. I'll show it on my blog and 'like' on my FB page. Thank you for the chance to win! Oops, just realised I'm too late! I've just followed from another blog and didn't notice the date, typical of me, a bit slow! Sorry you missed out Gill. I had to make the date to be before last posting dates for Australia so my followers from there could enter.